Each week, Big Issues focuses on newly released comic-book issues of significance. This week, they are Adventures Of Superman #10 (print) and #44 (digital). Written by Derek Fridolfs, Josh Elder, and Ron Marz, with art by Sean “Cheeks” Galloway, Victor Ibáñez, and Evan “Doc” Shaner, these Superman stories show the benefits of abandoning continuity and embracing classic interpretations of superheroes. Continuity is the great double-edged sword of superhero comic books, beneficial in that it creates a sense of history and growth for characters, but detrimental because it can make stories inaccessible for the new readers that the industry needs. Much to the chagrin of longtime fans, DC Comics eliminated most of its established continuity with the New 52 line-wide reboot in September of 2011, making its heroes younger, hipper, and, in theory, less complicated than what they were before. In practice, things got rather confusing, because while characters like Superman and Wonder Woman were brought back to square one, Batman and Green Lantern held on to past continuity so that writers Grant Morrison and Geoff Johns could finish telling the stories they’d been building for years. Those epic stories still existed, but readers were now supposed to believe that the events transpired within the five years that superheroes have been active in the New 52 universe, meaning Batman was endangering the life of a different child sidekick almost every year. Few properties have struggled in the New 52 quite as much as Superman, who currently headlines four different in-continuity titles: Action Comics, Superman, Batman/Superman, and Superman/Wonder Woman. While Action Comics has seen a surge in quality since writer Greg Pak and artist Aaron Kuder took over in November of last year, those other titles have become mired in New 52 continuity. Superman has been a mess since the beginning but has recently become a place for constant crossovers with other titles. Batman/Superman spends a lot of time tying in to DC’s Earth 2 when it’s not pitting the two leads against each other, and Superman/Wonder Woman still feels like an editorially mandated title, capitalizing on the romance between the two characters while incorporating elements of the Man Of Steel film. Putting Geoff Johns and John Romita Jr. on Superman this summer helps boost confidence in the future of the Super-titles, but before that happens, readers will have to sit through another crossover in May as the hero fights Doomsday in the pages of Action Comics, Superman, and Superman/Wonder Woman. This is particularly distressing news for Action Comics, which has blossomed by telling a self-contained story focusing on Clark Kent and his high school sweetheart, Lana Lang. In DC’s current publishing environment, plot takes precedence over character, which means that lots of events promise big moments but ultimately feel hollow. 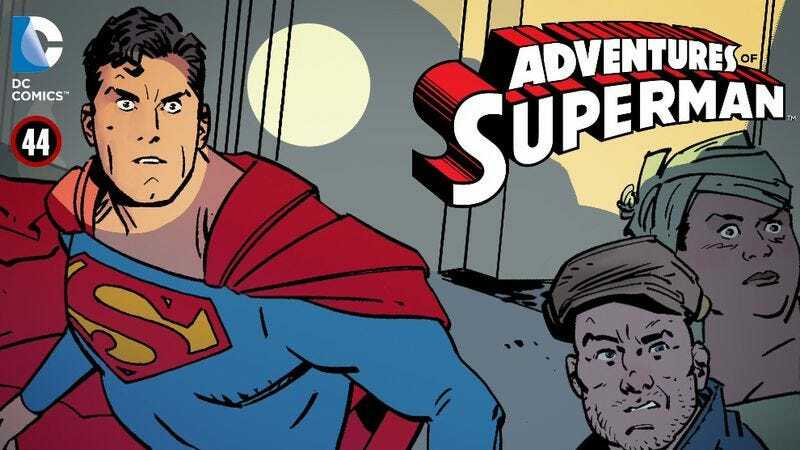 But there’s another option for readers who are looking for self-contained superhero stories in a more classic mode, and that’s DC’s digital-first anthology series: Adventures Of Superman (AOS) and Legends Of The Dark Knight (LODK). Created in 2012 to capitalize on the growing digital comics market, LODK features a diverse group of creators telling Batman stories set outside of normal continuity, giving writers and artists the opportunity to bring their version of the Dark Knight to life. Those stories are then reformatted for print so that retailers can get a piece of the action, a formula that proved successful enough that DC used it again for a Superman-centric anthology, as well as digital comics based on the 1966 Batman TV series, Teen Titans Go!, Arrow, Smallville, Batman Beyond, and The Vampire Diaries. While Legends Of The Dark Knight has proven to be very entertaining, the work done there isn’t quite as impressive as what appears in AOS, primarily because Batman is a character that is easier to write than Superman. The Big Blue Boy Scout has a tendency to feel dated, hence the aggressive attempts by DC to make him fresh in the New 52, but the creators working on AOS tap into the qualities that set the hero apart to deliver timeless, iconic stories featuring a Superman that still wears his red underwear on the outside. This week sees the release of three fantastic AOS stories, two in print and one digital. Underneath a cover that reads “Letter To Superman,” the print version of AOS #10 features two tales about sick children mailing letters to the titular character, and while that may sound repetitive, the two stories have dramatically different art styles and messages that make for distinct reading experiences. In the digital AOS #44, writer Ron Marz and artist Evan “Doc” Shaner continue their three-part story introducing the hero to DC’s version of The Iron Giant, reimagining the robotic Superman analog as a creation of Krypton’s Jor-El, making the machine something of a brother for the orphaned Kal-El. Each story is accessible for new readers and appropriate for all ages, showing how ditching continuity can free creators to do exemplary work. There’s some heavy material in Fridolfs’ script, but it’s extremely kid-friendly thanks to Galloway’s cartoony art, which incorporates chibi cuteness into an aesthetic heavily inspired by the Fleischers’ Superman animated serials. The settings are contemporary, but the Daily Planet and reporters are fashioned in a 1940s style: Lois wears a dress suit with a big bowtie and pin-up girl fringe at the front her hair, and the office uses typewriters instead of computers. Having worked on animated series like The Spectacular Spider-Man, Galloway has an incredible talent for capturing motion and expressions, and his coloring gives the artwork a glistening appearance that emphasizes the Fleischer influence. Galloway’s exaggerated interpretation of the lead character is a strong departure from the character’s current portrayal, but his style works incredibly well for the larger-than-life hero and is especially appealing to kids. While Fridolf and Galloway deliver a very charming, cute story, it’s the second tale in AOS #10 that makes this issue a must-buy. Written by Josh Elder and drawn by Victor Ibáñez, the short has Superman receiving a much different letter from a sick child and responding to it in a way that reminds readers why Superman is still relevant. Connie Jo Gholson is a young girl with cancer who writes Superman a letter telling him how much she appreciates him for never giving up, taking inspiration from his example as she undergoes treatment. The letter is presented over a fantastic scene of Superman fighting Metallo during Connie Jo’s visit to Metropolis with her parents, drawing a connection between the Kryptonite radiation the hero is exposed to and the treatment that Connie is currently struggling through. Paired with Matthew Wilson’s evocative color palette, Ibáñez delivers a dynamic action sequence that builds real stakes within a very limited page count, and he nails all the emotional beats of the script’s tearjerker final moments. Because the print editions of these books put two digital pages together, the layouts have a tendency to feel repetitive, but Ibáñez takes into account the overall look of the final printed page to bring more variation to his artwork. The look is both modern and classic, and that latter element is what is largely missing from the New 52’s version of Superman. “Dear Superman” is a deeply personal story for Elder, a survivor of Stage 3 Hodgkin lymphoma who cared for his mother as a child when she underwent cancer treatment, and the writer’s emotional investment in the character comes through in his script. He has a strong handle on Connie’s voice, writing a letter that sounds like it actually came from a child, and capturing that sense of innocence and wonder makes the narrative’s final moments especially impactful. It’s a touching moment that encapsulates Superman’s message of hope in a simple gesture, and switching to Connie’s point of view for the final shot makes it look like Superman is offering his hand to the reader. This is a story about a girl struggling with cancer, but it’s also a story about any ordinary person faced with life obstacles that are overwhelmingly difficult to overcome, showing that real heroism starts with believing in your own abilities. That last shot of Superman offering his hand to Connie is a challenge to the readers to take inspiration from the hero the same way this little girl does, asking them to apply the hero’s message in their own lives. Pairing Superman with The Iron Giant is such a great idea that it’s a wonder no one has done it yet, and Marz and Shaner’s AOS #44 delivers an outstanding second chapter that details the Kryptonian robot’s backstory while providing lush, detailed visuals. The plot began last week with Clark Kent pitching a Daily Planet piece about two brothers adopted by different families who later reconnect, an article that Lois Lane quickly labels “fluff”; it’s not difficult to see Lois’ response as the same reaction Marz and Shaner would get from DC if they tried to pitch their “Superman meets Iron Giant” story for one of the publisher’s in-continuity titles. It’s simple, heartfelt, and exactly the type of Superman story DC should be publishing on a regular basis, using the broad strokes of the character’s mythology to offer insights into the hero’s life while delivering bombastic superhero action. Marz finds an ingenious way of folding The Iron Giant into Superman’s world by making him a scout for habitable planets in the event of Krypton’s demise, a position that was compromised when an alien armada discovered him and reconfigured him as a weapon for conquering worlds. For the brilliantly realized flashback, Shaner eliminates panel borders to create gorgeous free-flowing images and uses classic Silver Age Krypton designs to heighten the retro look, and colorist Matthew Wilson uses an icy blue to bring a sense of melancholy to the final visuals. With a style heavily reminiscent of current Daredevil artist Chris Samnee (who also happens to be a frequent collaborator with Wilson), Shaner has all the makings of a comic-book superstar, balancing realistically rendered environments and characters with kinetic action sequences that embrace the fantastic nature of superhero comics. Shaner’s depiction of Superman is the strongest of all the artists with AOS stories this week, strong and dignified but also youthful and friendly. If Shaner wasn’t working on the upcoming Flash Gordon ongoing from Dynamite Comics, he’d be a perfect artist for DC’s regular Superman titles. Giving creators like Shaner, Elder, Galloway, and company the opportunity to display their talent on one of the world’s most popular superheroes is the best thing about AOS, and they’re able to tell stories on their own terms, thanks to the series’ lack of continuity. It’s a format that more superhero titles should embrace, stripping the character down to his essential parts in order to build accessible, engaging stories for both new and established fans.